In the B2B world, sales don’t appear out of thin air. Instead, most deals are closed as a result of sales reps working through a well-defined sales pipeline. This pipeline is the process by which prospective customers are moved through the buyer’s journey and converted to paying customers. Although the terms “sales pipeline” and “sales funnel” are often used interchangeably, these terms actually mean very different things. Your sales pipeline is the specific sequence of actions your team takes to convert sales leads into closed sales. Your sales funnel, on the other hand, is a visual representation of the proportion of leads that pass through each stage of the pipeline. Together, these two concepts are used by all successful sales teams to optimize their lead conversion rates. 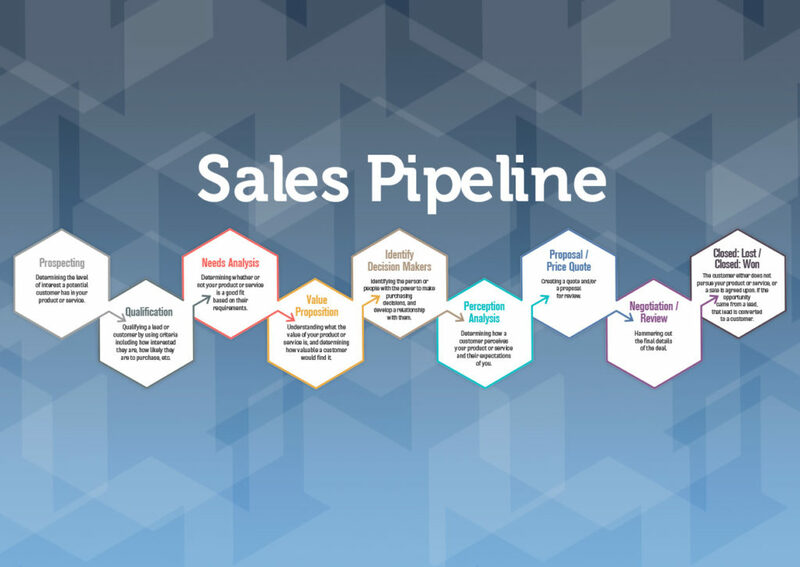 Without a clearly-defined sales pipeline, you run the risk of missing opportunities to support valuable leads and convert them into lasting customers. Luckily, sales CRM software makes it simple for sales reps to track opportunities in a standardized way. By setting up your preferred sales pipeline stages in a CRM, reps can quickly update opportunities as they progress. They can also easily identify which deals are closest to closing so they can focus their time and effort accordingly. And by monitoring every sale from start to finish in a centralized system, you can measure your conversion rates at different stages and use this data to refine your sales strategy. Of course, every company has a unique business model, so there is no “standard” sales pipeline that will suit every team’s needs. However, the pipeline stages outlined below are a good starting point for many businesses. Your sales pipeline should always start with prospecting, or identifying your lead’s level of interest in your products or services. Chances are, you’ll observe the highest amount of interest among prospective customers who fit your marketing personas. These personas act as representations of your target buyers and are based on the demographics and behavior of your existing customers. Individuals who align with one of these personas will have presumably have a desire for what you offer, and they show the highest conversion rate when nurtured through every stage of the sales pipeline. Qualification of your sales leads is the next stage of the pipeline management process. You will need to use certain criteria to identify which prospects are most likely to make a purchase and therefore should be pursued further. The lead’s interest level and marketing persona alignment (as determined in the previous stage) are important criteria. Other key items to look at include budget, need, and timeline for purchasing. You can automate this qualification process with your CRM software or complete it by hand using a lead qualification template. At the needs analysis stage, it’s important for sales reps to take a step back and look at their products and services from the customer’s perspective. Where is the customer coming from and what problems are they trying to solve? The goal is to assess exactly how your company’s offerings can resolve certain pain points. And if the answer is that they can’t, that’s okay too. It’s better to realize this early on than to try to force a sale that won’t benefit the buyer. The fourth stage in the sales pipeline is value proposition. This stage gives sales reps a chance to assess the value of their offerings in the scenario at hand. Using the information gathered in your needs analysis, you must determine how valuable a customer would find your products or services, based on their pain points. This will improve your ability to promote your products or services in a way that speaks directly to the buyer, rather than simply stating the specs. In many B2B sales scenarios, the individual you sell to isn’t the person who ultimately has the power to pay you. At this stage of the sales pipeline, you need to identify and engage with key decision makers. Ask your current contact or do your research to find the person who makes the purchasing decisions at the company or organization in question. You must then reach out and cultivate a relationship with this individual in order to get closer to closing the sale. In the sixth stage, you have to consider that the actual value of your products or services does not always match their perceived value. The buyer’s impressions of your offerings and your company play a big role in your team’s ability to close the sale. Not surprisingly, leads who already hold positive or neutral perceptions at this stage offer the best outcomes for you. However, you should also strive to develop strong sales practices that can overcome negative perceptions. Take the time to learn about your lead’s concerns and offer solutions to address them. If you reach this point in the sales pipeline, things are going well. This stage revolves around the creation of a price quote or proposal for your prospective customer. While it’s good to use standardized templates for all of your company’s quotes, each one should be personalized to match the customer’s specific needs. Make sure all pain points are addressed and all relevant terms and conditions are included. To streamline this process, look for a CRM that offers quoting functionality alongside sales pipeline management. At this stage in the sales pipeline, you should review the proposal with your customer and finalize the details. Make sure they understand the terms and conditions and answer any last-minute questions they may have. You will need to keep a close eye on things at this stage, as letting something slip through the cracks could be a dealbreaker. Sales reps will also need to know their limitations when negotiating on behalf of their company to effectively close the sale. The ninth and final stage of sales pipeline management centers around closing the deal. Whether you win or lose the sale, it’s important to see it through to the end and get a final answer from the customer. Upon determining the outcome of your sales efforts, document the details in your CRM to allow for ongoing data analysis. Over time, information on won and lost sales opportunities can help you refine your sales pipeline stages and improve your sales tactics. To make the most of the sales opportunities that come your way, you must have a clearly defined sales pipeline. Use the stages described above as a starting point, but don’t be afraid to evaluate and refine them over time to develop the perfect process for your business. Ultimately, this pipeline will give your team the structure it needs to convert leads to lifelong customers.